Leather leggings have become a mainstay in the closets of our favorite bloggers, celebrities, and street style stars. However, others have stayed away from the now-classic pant, feeling that they don't align with a vegan lifestyle. Thankfully, faux-leather leggings started popping up to fill the void, allowing more people to wear the growing trend. At first they weren't the best quality, but that's now a problem of the past. Today there are so many great options that look just like the real thing. The other plus is that these faux-leather leggings come without the hefty price tag of the real deal. Done and done. As for how to wear the leggings, we're happy to report that the outfit ideas are endless. You can go the off-duty model route and wear your pair with a basic tee or sweater layered under a leather jacket (faux of course!). Another option popular ensemble as of late for the colder weather is to pair yours with an oversize puffer coat and statement sneakers. For a more middle-ground ensemble, try yours with a checked blazer, classic sweater, and ankle boots. Still need convincing? Scroll on to shop our roundup of the coolest faux-leather leggings online. This pair has sleek patent (faux)-leather panels that bring them to the next level. A classic pair of faux-leather leggings goes with just about everything. They also come in a pretty dark brown hue. Dress this under-$50 style up with heels or go casual with a pair of sneakers. The patent trend is still going strong, and this is an easy way to incorporate it into your wardrobe. We love, love, love textured leather. A moto-style leather legging add a downtown-cool feel to your next outfit. This contrasting pair looks super luxe but comes in at under $100. 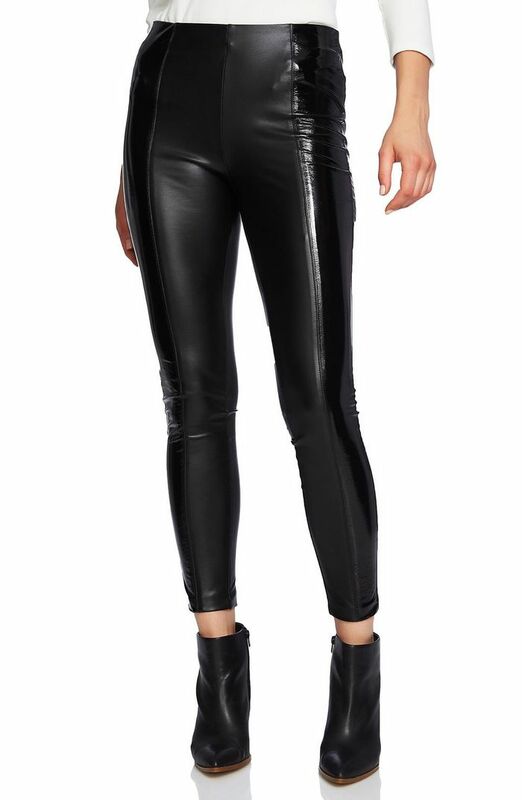 A zip-cuff adds an extra detail to these otherwise timeless faux-leather leggings. These leggings will come in handy three seasons of the year: fall, winter, and spring. This pair has a cool side stripe that gives it a super-sporty feel. Per the good reviews this pair runs small, so make sure to size up. This punk-inspired pair comes from one of our favorite British brands: AllSaints. If you're looking for a high-waisted pair of faux-leather leggings, this is a great option. Add an edgy feel to your next look with the zip-pocket detailing of these leggings. These leggings make for the perfect going-out look. Front ankle slits help make a cool statement. With a slimming design and cool textured detailing, these are a major must-have. Looking for a more prominent ankle zipper? Give this popular style a try. These wallet-friendly leggings elevate just about any outfit. Side stripes are popping up everywhere, including on this sleek pair of leggings. Curious to learn more about faux leather? One of our editors set out to explain exactly what vegan leather really is.